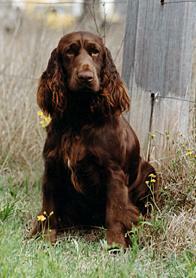 A NSW breeder re-introduced the Field Spaniel into Australia in 1989. The number of Field Spaniels is slowly increasing. This is a breed for the energetic! They are active, tireless and inquisitive and can be noisy and if not fully occupied can be destructive. The Field Spaniel is a loving and sensitive breed that adores being with people and involved in all the household activity. The Field Spaniel requires firm and consistent training. They enjoy traveling and car rides.